I am really fascinated by Umami. For those of you who haven’t come across this word before, Umami is a Japanese word that means ‘pleasant savory taste’. Chef Kiyomi Mikuni describes the actual Umami taste as, “If you have two mini-tomatoes and chew them 30 times before swallowing you should feel a strange sensation that spreads in your cheeks.” It’s time to learn some fun facts for the day. 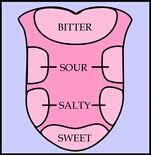 It’s been agreed for centuries that the human tongue registers 4 primary groups of taste that we call Sweet, Sour, Salty & Bitter, these taste buds neatly sit on our tongues and detect the known elements of taste. In Japanese cuisine they have long used dried Dashi stock, which comes in numerous forms and can be made from kombu (dried kelp/seaweed), katsuo-bushi (dried bonito flakes), niboshi (dried small sardines) and hoshi-shiitake (dried shiitake mushrooms). Back in the late 1800’s/early 1900’s Kikunae Ikeda, a Japanese chemist (later Dr. Kikunae Ikeda of Tokyo Imperial University/University of Tokyo), was fascinated by the tastes contained in Dashi, and launched himself into a period of research to determine exactly what components of Dashi created this intriguing taste. In 1908 he successfully extracted glutamate from the kombu part of Dashi, and further discovered that the amino acids in glutamate were responsible for this wonderful taste, which was a main feature of Dashi, and coined the term ‘Umami‘ to describe it. Ikeda was sure that other savoury foods had this special taste in common, including ingredients popular in Western cooking such as tomatoes and meat, and, indeed, upon investigation it was discovered that these foodstuffs also contained Umami. For a long time, Western researchers were skeptical about the existence of Umami, claiming that the taste Ikeda was describing was a combination of the four other tastes. They had trouble identifying the glutamate acid in, for instance, tomatoes, because tomatoes also contain sweetness and sourness, making the identification of Umami difficult. In fact, it wasn’t until the 1980’s that various studies proved that Umami, found in glutamate, actually constituted a legitimate fifth basic taste and it took until the 2000’s for Umami to be internationally recognised and accepted when glutamate receptors were discovered on the tongue. After glutamate was found to be a trigger for Umami, other components that trigger this taste have also been discovered, namely inosinate which is found in bonito flakes, and guanylate which is present in shiitake mushroom stock. It is a big factor in MSG, which explains exactly why that food additive is so appealing. It was determined that foods such as mushrooms, chicken eggs, beef, pork, chicken, cheese including Parmesan, onions, fish including anchovies, Worcestershire sauce, Marmite, shellfish, celery, potatoes, carrots, spinach , green tea and soy sauce, amongst others, contain the Umami elements, either derived from glutamate, inosinate or guanylate. It was also revealed that Umami is one of the first tastes a human being encounters, as breast milk is rich in glutamates. While still living in the UK I was wandering through Waitrose (other Supermarkets are available) and noticed a tube of cooking paste on a shelf called ‘Taste No. 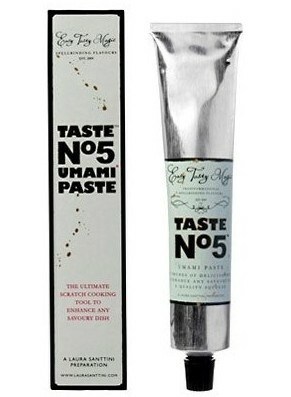 5 Umami Paste,’ containing, amongst other things, a concentrated blend of Umami-rich ingredients like Parmigiano-Reggiano cheese, porcini mushrooms, anchovies, tomatoes and garlic. I brought it excitedly, thrilled that here was a readily available culinary nod to the cooking appeal of Umami. This paste was developed by Laura Santtini, who runs her family’s Italian restaurant, the famous Santini, in London. She released this paste because, as she told The Independent, “I wanted to get away from the notion that Umami is something of interest to scientists that no one else can really understand. The truth is that Umami should be of interest to anyone who has a tongue.” It was great to cook with and added a certain something special to my pastas, stews and soups as well as giving a zing to some of my fish and meat dishes. I’d recommend buying a tube if you notice it on a shelf, and see if it becomes a regular fixture in your cooking or not. However, with so many Umami-rich foods out there you don’t need to rely on a concentrated paste to allow you to enjoy Umami, and so if you’re interested in making the best of this most intriguing of tastes I suggest that you do an internet search for Umami themed recipes, or treat yourself to one of these cookbooks, like the bizarrely titled ‘The Fifth Taste of Human Being Umami The World’ by Yoko Takechi, ‘Dashi & Umami’ by my beloved Heston Blumenthal or ‘The Fifth Taste: Cooking with Umami’ by Anna & David Kasabian.